The main source of Chinese root vegetable radish juice has been traditionally used for centuries to help treat various diseases like gallstones. 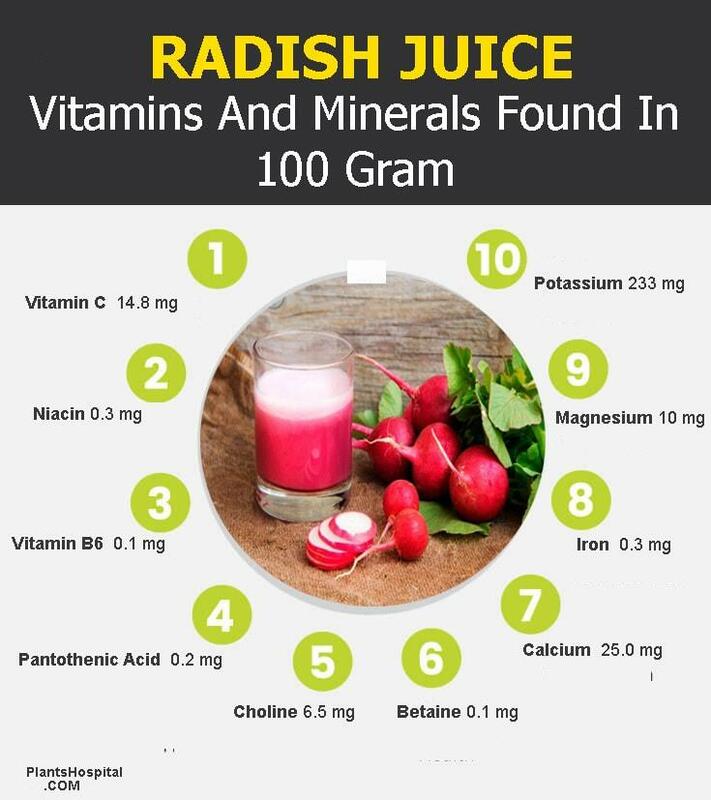 Radish Juice a good source of calcium, iron, fiber, vitamin K, B6, potassium and phosphorus. To prepare radish juice, you can cut the root and peel the Red shell. If you wish, you can also throw a solid fruit juicer with root and bark. The taste may be a little too heavy, you can mix it with carrot and apple juice to soften. You will prepare a cocktail with equal amount of radish, cucumber and green pepper juice, sinus congestion, bile and liver problems can be good for many ailments. 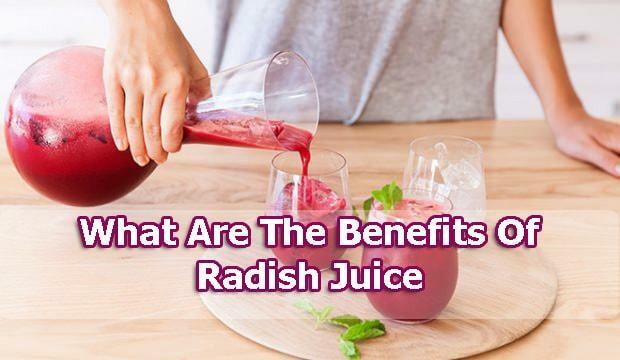 Radish Juice And Jaundice: Radish juice that works with liver and cleans blood with antioxidant effect can be used as an aid in the treatment of jaundice. By increasing the amount of oxygen in the blood, It reduces the damage that occurs in red blood cells. Black radish against jaundice is more recommended. 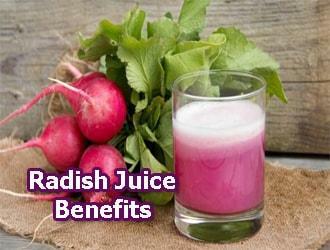 Urinary Disorders: Radish juice increases urine production. It protects against kidney and urinary tract infections by cleansing the kidneys. Weight Loss: Because it is slowly digested, it prolongs the feeling of fullness and helps to lose weight. Skin Care: Containing some of the vitamin C, phosphorus, zinc and B complex vitamins, radish keeps the skin moist while preventing cracks caused by dryness. Measures: Since there are very few scientific studies on the benefits of radish and radish juice, the use areas listed above are traditional forms of use among the public. If you are complaining about these disorders, you should go to a doctor to learn about professional treatment methods rather than treating yourself, and prevent further serious health problems that may occur. What Are The Benefits Of Radish? The Latin name raphanus sativus and the motherland of Mediterranean region. The composition of radish contains mustard essences, methylmercaptan, gluconasturtin, raphanol, pentosane. ✓ There is effect of stimulating the organism. ✓ It may be helpful to drink 1 teaspoon of radish juice against cold cough. Honey radish juice is useful for cough and whooping. ✓ It is useful for those with high blood pressure with potassium content. ✓ High levels of glucosinolates, which have a protective effect against cancer. ✓ Contains fiber content and glucosamine compounds are protective against bowel cancer. ✓ Can be used to strengthen the gums. ✓ It facilitates digestion by its effect on the gallbladder. ✓ It stimulates the digestive system. ✓ Run stomach and intestines, disinfect the intestines. ✓ Red antioxidant substance provides protection against cancer. Red radish is more beneficial than white radish. ✓ According to a study conducted in Singapore, regular consumption of vegetable by the radish group reduces the risk of lung cancer by 30% in non-smokers and by 69% in smokers. 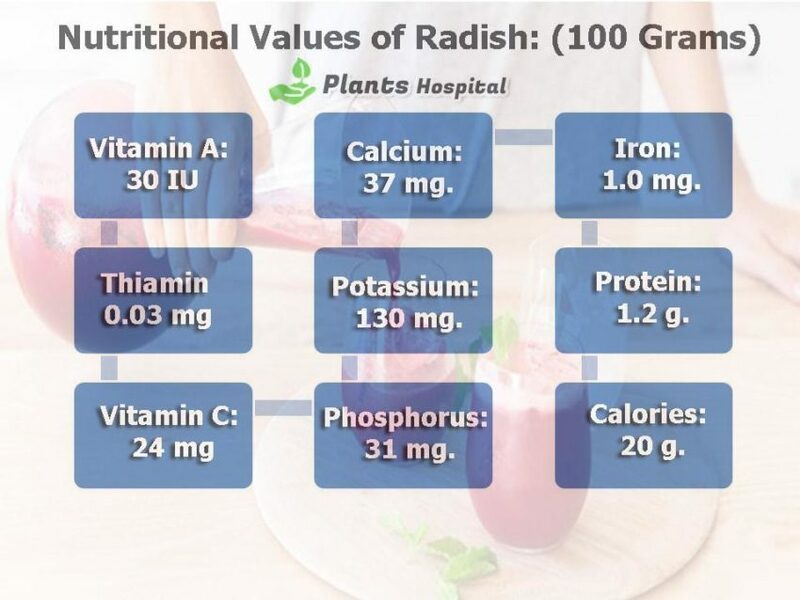 ✓ Radish juice may be useful for gallbladder disorders. ✓ Contains folic acid, vitamin C, potassium, calcium, iron mineralium. ✓ The E commission responsible for the preparation and licensing of herbal preparations of the Ministry of health of Germany has approved the use of the black radish root in functional diseases of indigestion, bronchitis, gallbladder and gallbladder. ✓ Red Radish has more antioxidant effect than white radish. ✓ Black Radish is one of the most useful types of radish in terms of impact. • Medium size radish grate after is mixed two tablespoons with honey, wait 5 hours and squeeze the pulp. Take one teaspoon of honey several times a day. • The radish juice obtained by the kitchen robot is kept in the fridge for a while to lose the burning taste. Then it is mixed with honey and consumed. It should be used fresh every time. • The use of mustard oil as a cure should not exceed 6 weeks as it may have an effect on the irritation of the stomach mucosa. • When eating radish should be eaten without salt. • Warning: Stomach problems may cause burning and gas in the stomach, so those with stomach problems should not consume too much. • Excessive consumption of oxalate can cause mineral loss. Oxalates cause the Elimination of calcium and iron minerals from the body. • People who shed oxalate stones from their kidneys should not eat too much. • Because radish reduces the body’s absorption of iodine, it is advisable for those who eat too much radish to consume iodine rich foods and iodized salt. ~ Vitamin A: 30 IU. ~ Vitamin C: 24 mg.